Find your favorite flags of the world stickers at StickerYou! Create customized flag stickers to celebrate the Olympics, the World Cup, the playoffs, or the Super Bowl. Great for showing support for your favorite sports team and bumper stickers! Have fun with flags! From the American flag, Canadian, France, China, or England… make stickers of all your favorite flags, where you want to go, or where you’ve been. When you travel, you can make a sticker for each place you’re getting ready to visit or once you’ve been there. Stick on your suitcases; make stickers for cars, or to decorate your favorite things from laptops, phones, notebooks, even windows! When you make scrapbooks of your trips, include stickers of the flags from your travels. If you’re making your flags from trips, you can the travel dates and who you went with on the flags. They can also make for a fun way to teach kids the different flags of the world. Our high quality, glossy vinyl material goes on most materials smoothly, bubble free, and will last long. They are weather resistant, will endure the fridge, freezer, dishwasher, even the washing machine! Want to include a variety of different flags? At StickerYou, you can! 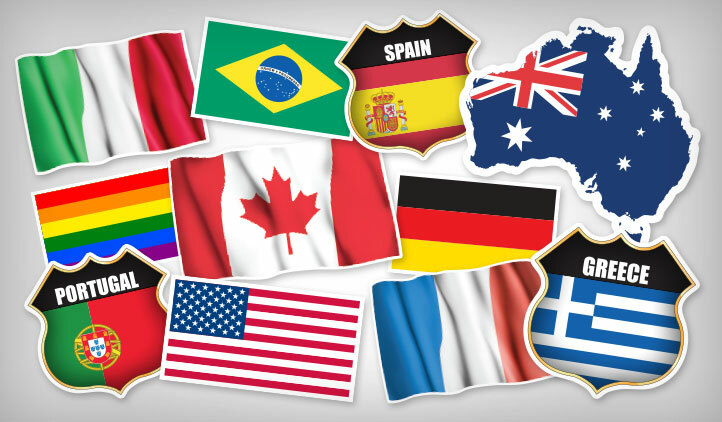 Using the classic sticker maker, select the flags of your choosing from around the world. Use as many as you can in the sizes you want to fill the page.